Discount grocer Aldi opening 4th store in San Diego County | Eleven Western Builders, Inc.
Eleven Western Builders is the general contractor on the Aldi in Escondido and was also the general contractor on the Vista and Chula Vista locations. Discount grocery chain Aldi is increasing its San Diego footprint with a fourth county location already under construction at Escondido Valley Center. The new store, spanning nearly 22,000 square feet, is taking over half of the space previously occupied by the out-of-business Sports Authority, which closed its doors in June of last year. The latest Aldi location is tentatively slated for an end-of-year opening, and is the second Escondido venue for the chain. Started in Germany in 1961, Aldi takes a less-is-more approach to grocery shopping, offering customers bargain prices in exchange for a frill-free experience. That means less space and choice, as well as no in-store banks, coffee kiosks or pharmacies. The grocer is also known for its in-house branded selection of products,which make up 90 percent of grocery items for sale. Aldi first arrived in San Diego in May of last year with a Vista venue and has since opened two other stores in Chula Vista and Escondido. The opening of a second Escondido store is part of the brand’s $3.4 billion nationwide expansion plan, with the goal of growing from 1,600 U.S. stores to 2,500 by 2022. With 2,500 stores, the brand said it expects to be the third largest grocer in the U.S. and serve 100 million customers per month. The grocer, however, is growing amid a tricky period for brick-and-mortar shopping centers and their tenants, each facing competition from online retailers. A recent report from Credit Suisse projects that 20 percent to 25 percent of U.S. malls will close over the next five years. And Amazon’s acquisition of Whole Foods is expected to disrupt the status quo in the way groceries are sold online and off. Grocery, however, remains a predominantly offline business. Just 0.1 percent of annual food and beverage store sales, or about $1 billion, occurred online, according to CBRE’s analysis of 2015 e-commerce census data. 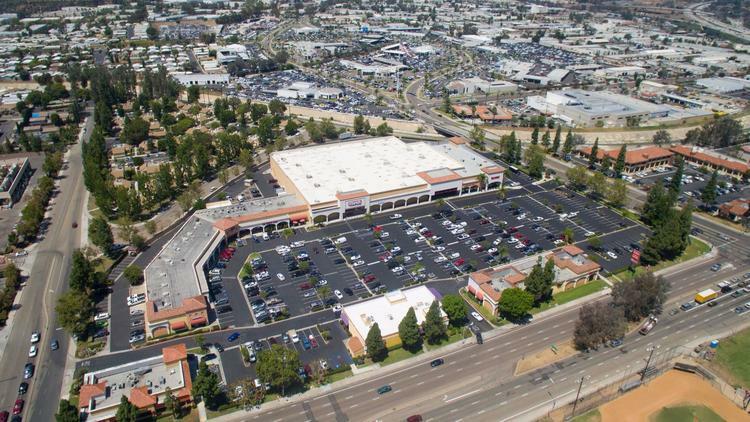 The Aldi store at Escondido Valley Center will sit next to a new HomeGoods location, which is taking over the remaining 24,000 square feet previously occupied by Sports Authority. The opening of that HomeGoods location is not being disclosed. Originally posted June 26, 2017 at The San Diego Union-Tribune by Jennifer Van Grove.